Montreal vs. Boston? How do you like those apples? As teams begin to clinch playoff spots and others are officially eliminated despite being out of contention for months (looking at you Edmonton), it is time to look at the remaining few games those teams on the playoff bubble have left. In the East, there is not much up for grabs anymore with the way the Buffalo Sabres and New York Rangers are playing. According to Sports Club Stats, the Rangers are 98.3% guaranteed to make the playoffs after going 8-1-1 in their last 10 games. This is from a team that once had the Maple Leafs in their rearview three weeks ago. The Sabres have a 91.6% chance of making the playoffs after strong play under new owner Terry Pegula where they've gone 11-5-3 since he bought the team. The Montreal Canadiens and their players are slumping of late, having been shutout in 3 straight games. While this does not bode well for the post season, the Habs are almost a lock to make the dance with their 7 point lead over the 9th place Hurricanes. While the Hurricanes can make it interesting with their final 7 games, they are listed as a 11.5% chance of making the playoffs. 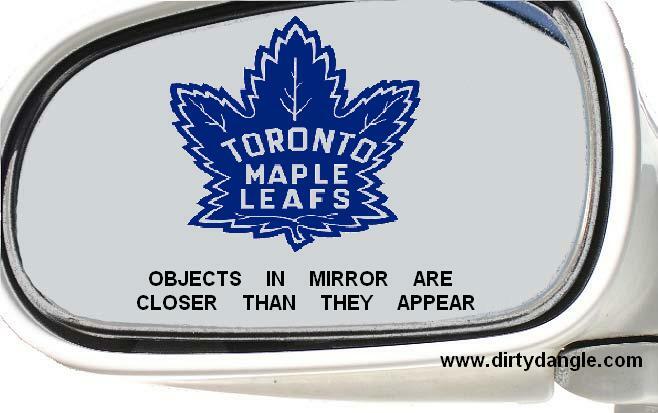 As for the Maple Leafs, it's only a matter of time before they are officially counted out. The West is a lot more interesting, and has been for some time. While some teams have dropped out of the playoff hunt (Minnesota and St. Louis) and others are considered locks for the playoffs (Vancouver, Detroit, San Jose), there is still a great deal to be decided from seeds 4-10. The Yotes' look good to make the playoffs (93.5% chance), and a division championship is not out of reach either. With five games left, it is not out of the question to think they can beat DAL, COL and LA before a home and home series with division leaders San Jose. The Coyotes will be hoping for home ice advantage for the post season, but it is unlikely with NSH and LA hot on their heels with games in hand. Sorry to those 10,000 Phoenix Coyotes fans who attend their games. The Preds also stand strong to play in the post season, with a 95.3% chance of making it. Barring a meltdown, Nashville could also be looking at home ice advantage come mid-April. With a record of 8-1-1 in their last 10, Pekka Rinne and the Preds are steamrolling into the playoffs and will be hoping to make it out of the first round for the first time in their history. Nashville also has 4 out of their final 6 games against non-playoff teams, meaning they could hit the 100 point mark again this season. 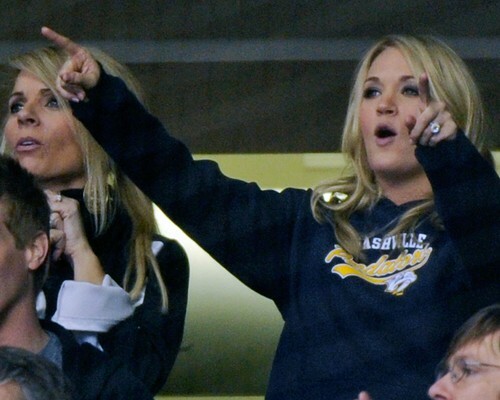 Carrie Underwood approves. The Kings have been dealt some blows lately on the injury front. First, Justin Williams was lost, and now leading scorer Anze Kopitar is on the shelf with a broken ankle. The Kings are a 95.2% chance of making it, but will face a tough test when they finish their final four games of the season against SJ, PHX and a home and home series with the Anaheim Ducks. The Kings still have a good team, but will depend on Jon Quick to keep their ship steady. Oh, and maybe that guy Dustin Penner could show up? The Ducks are flying high with top line Ryan-Getzlaf-Perry scoring at will and the ageless Teemu Selanne providing leadership on the scoreboard (3 goals, 2 assists last night in 5-4 win). They are a 81.9% chance of making the playoffs despite sitting 7th in the West. The final six games of their season could potentially break them, or be a good prep for the gruelling playoffs. Games against CGY, SJ, DAL, SJ, and that home and home with the Kings will be a fun stretch to watch. As long as Jonas Hiller and his vertigo can keep looking forward, the Ducks will strike some fear in the higher seeded playoff teams. 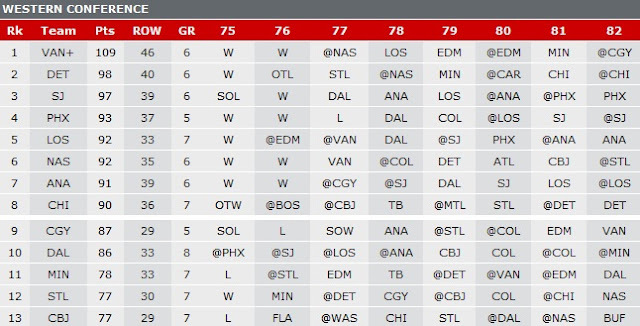 Their 38 regulation or overtime wins help them should any tiebreakers be brought in. The defending Stanley Cup Champions (or what's left of that team) are currently sitting in 8th place after a 3-2 OT win over Detroit, but anything can happen in their final 7 games. Captain Jonathan Toews has been a proven leader for the club the past month, and many have thought of the word Hart when mentioning his name. The road ahead in tough for the Hawks with games against BOS, TAM and MTL, not to mention a home and home with the Red Wings to finish the season. Those last two games could make or break the Hawks post season hopes - beat the best and make the playoffs, or get Kronwalled. The Flames have been grabbing points here and there; however they have certainly shot themselves in the foot by dragging important games into shootouts. Every game is a must win for the Flames, and with their remaining games against ANA, STL, COL, EDM and VAN, it will be interesting to see if Calgary can put a win streak together. The Flames have shown post season promise this season, but have also shown some sizzle - these five games will show what the Flames are made of. 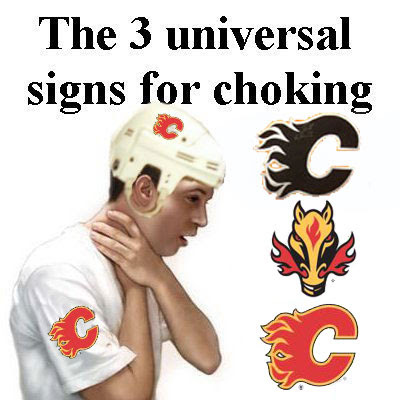 Statistically, the Stars have a better chance of making the playoffs (37.3%) than the Calgary Flames. The next four games against PHX, SJ, LA, and ANA could vault them into the playoffs and an easy stretch against CBJ, COL, COL and MIN to wrap up their season could solidify a playoff seed. Grabbing 12 out of 16 points is realistic for the Stars in this stretch and we could see some playoff hockey in Texas this spring. What do the readers think? Who's making it to the big dance come April 12th? And who's got to go see about a girl? Great flick and great post. I would say the West is set. I don't see the Flames or Stars sliding in. Boston vs Montreal first round would be amazing. I hate seeing PHX and Nashville in the playoffs. Two hockey markets that shouldn't have a team. 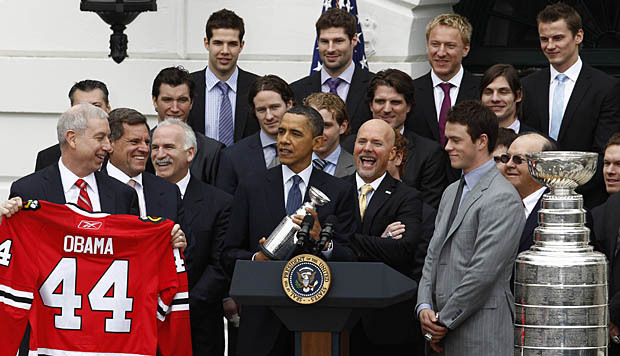 Blackhawks taking out the Canucks in the first round. Can't wait to see that. And there is noway the Flames and Stars will be making the playoffs. big win for the Leafs, I still BELEAF! I hope Carolina makes it in over Buffalo. I hate watching the Sabres play, not to mention the city is dump. Carolina fans are always rowdy and don't need a new owner to spark new interest. Boston would feed it to Montreal. I like those apples! Bruins will be knocked out in the first round. I don't have any faith in their forwards. Sabres were a very talented team down the stretch, and continue to be with Jonas Enroth playing amazing... Leafs didn't get much help from some other teams (Boston, Lightning, Philadelphia) and for that, I will not be cheering for any of those teams come playoff time.